Love this because half the items pictured came from the street (table, stools, coffee table) and the rest from Craigslist. See the full story in The New York Times. Then again, this is a second home. It's probably still tacky to street-furnish your first and only home. our couch and bar stools are from craigslist. i'm a true believer! 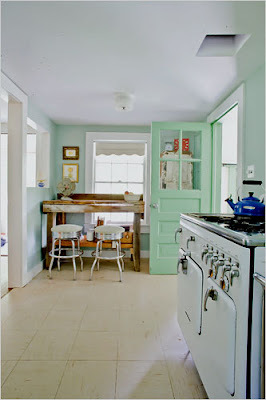 the sea foam color in this house is fantastic. "Then again, this is a second home. It's probably still tacky to street-furnish your first and only home." I had to laugh at that because in those circles it's probably true. Maybe it would be okay if we started referring to Goodwill as an antique store. 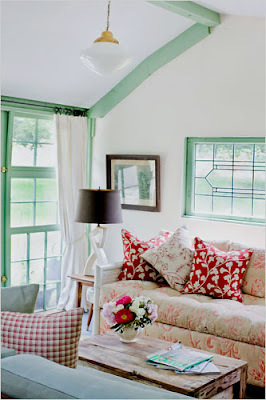 Seriously, that is a cute little cottage.